The last time Jerusalem was the capital of Israel the Roman Empire controlled the land and the Temple was still standing. Known then as Judea, the territory of the tribe of Judah with Benjamin and to the North, Samaria, the territory of Israel the ten tribes. It was during this period around 56 BC that the Mashyach, Messiah, the Lamb of God, was was born. Thirty years later he was revealed to Israel, rejected by his own people and later crucified. God resurrected him from the dead on the "Third Day" and he was seen by over 500 people, later he ascended into heaven. 70 years later the Romans attacked Jerusalem and destroyed the Temple leaving no stone upon another, as was prophesied by the Mashyach (Messiah). THERE IS NO PHYSICAL TEMPLE ON EARTH, WHY? YAHUSHAH (Jesus) the Mashyach (Messiah) was the promised "Lamb of God" that was foreshadowed by the שה (Hebrew for Lamb "Shah") provided by Yahuah to Abraham in place of Isaac on Mount Moriah and the שה "Passover Lamb" in Egypt that Redeemed the "First Born" of Israel from the Destroyer, EXODUS 12:3-14. The Tent of Meeting and later Solomon's Temple built on Mount Moriah, with all the sacrifices required under the "Law Covenant" for 'Sin', could never take away "Sin in the Flesh" but continued right down to the destruction of the Second Temple in 70 CE. During His earthly ministry the Mashyach first spoke in parables to His own people Israel, his words were backed up by Miracles of healing and raising the dead to confirm who he was. He spoke about the 'New Covenant' from His Father that would result in His death and resurrection, after which, the things that were a shadow or representation of the Heavenly things, were to be taken out of the way and replaced by the "New Covenant" through his blood, the Blood of the Lamb. After Israel rejected the Mashyach (even though many did accept Him) His disciples went to the Nations of the World with the 'Good News' to bring both Jew and Gentile together in Faith. These prominent men of Jewish Christian authority eventually became known as the early 'Church Fathers'. Their Greek writings spread truth mixed with philosophical reasonings that formed the foundation for the adoption by Rome. By the time of Emperor Constantine around 300 CE the birth of the 'Antichrist Church' had arrived. For over 1,700 years the 'Truth' has been under attack, even today we live in perilous times, but we are nearing the last days. Once the full number of the Gentiles (Nations) have been gathered, Yahushah will return, resulting in His People, the Jews, accepting Him as their King. Prophesies spoke of the return of the Mashyach (Messiah) at a time when the world would be united against Israel, a people returned from amongst the nations to their land. This has happened in this generation, the generation that will see the return of the Shepherd of Israel. Abraham was told by Alahym (God) to take Isaac up to Mount Moriah and offer him as a burnt offering. Isaac said to his father in Verse 7, "...but where is the lamb for a burnt offering..."
Hebrew: "...ואיה השה לעלה...", Abraham said to Isaac, "God will provide himself a lamb..."
Hebrew: אלהים יראה לו השה (written from right to left). Prophetic fulfilment of this account took place at the baptism of the Mashyach (Messiah) when John the Baptist identified Him as such. He was the "Sacrificial Lamb" "השה" the lamb of יהוה Yahuah or יהושה Yahushah His name would mean "Yahuah's Lamb". He was God's "Only Son", John 1:29 "Look! 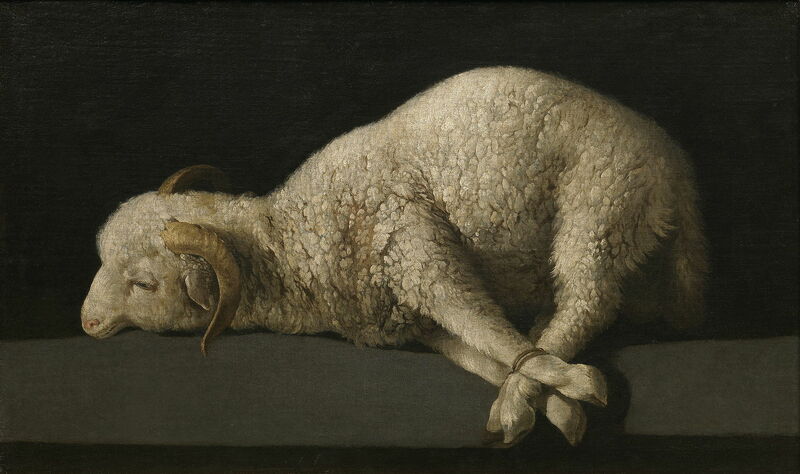 the Lamb of God that takes away the sin of the world"..., He was the price paid to redeem us to God and take us out from under the Law which brought death. The Law given to Moses, the "Ten Commandments", shows us what sin really is, and because of sin that dwells within us we are all under the sentence of Death. We all commit sin and none of us can say we are Righteous. Adam and Eve chose to listen to Satan rather than God. By this one act, the desire to please themselves instead of God, known as "Sin", brought death. They could not continue to live in Eden and live forever so they were cast out to serve Satan and to serve their sentence of hard labor, disease, sickness and finally in old age, death. With animal sacrifices, God overlooked sin, but those sacrifices could never take away sin dwelling in our bodies, so we continued to sin by varying degrees, resulting in death. God's Love provided a new way, an agreement made between the Creator and His Creation, through the body and blood of The Lamb, His Son, and through faith, which is acceptance of His Sacrifice on our behalf, the 'Law Covenant' that demanded sacrifice for sin is removed. By believing, having Faith in the 'New Covenant' agreement we are dead to our old self that followed Sin (shown to us by the Law) and are made right with God by following the directions of His ריח קדוש "Holy Spirit". We were sold under 'Sin' but have now been 'Redeemed' by the 'Body and Blood of the Lamb'. So now, we live, no longer following our own desire but follow the desire of our 'Heavenly Father'. Whether Jew or Gentile (the rest of the world) there is no difference, we are all children of Abraham if we follow the way, or path, set for us by the Mashyach that makes us right with Alahym. ZECHARIAH 12:10 ROMANS 11:26-27 Israel will understand this when they see the wounds in the Messiah's body when He arrives from the heavens to begin His rule on Earth. Will Israel come under attack? Most certainly, because this is the signal for the destruction of their enemies, they will not be fighting on their own! The outcome is certain for their God will give them the victory. It is a common belief that Israel and in particular Jerusalem will be taken by the nations when they come against Israel and only a third of the people will be left in the ruins. This actually happened in 70 CE, as prophesied by the Mashyach (Messiah) and does not apply to the present situation. JEREMIAH 31:31-34 ...A NEW COVENANT, 35-40 THE DAY IS COMING SAYS THE LORD WHEN ALL JERUSALEM WILL BE RE BUILT FOR ME, ...THE CITY WILL NEVER AGAIN BE CAPTURED OR DESTROYED. Notice it does not say the Temple will be rebuilt. This is what believers have been praying for, for the last 2000 years and it's about to happen soon. NLT, MATTHEW 6:9-10 ...Our Father in Heaven, may YOUR NAME be kept holy 10, May YOUR KINGDOM COME soon, May YOUR WILL be done on Earth as it is in Heaven... (emphasis mine). We have to know and Love The Father, "with ALL our heart, with ALL our soul and with ALL our mind", before we can truly "Love our neighbours as our selves". The entire law and all the demands of the prophets are based on these two commandments. This Love is in His Son and by knowing His Son, we see the Love that The Farther has for Him and for us. The Mashyach (Messiah), who is to come very soon, is the one who died as the "Final Sacrifice" for us All, "HE IS OUR RIGHTEOUSNESS".